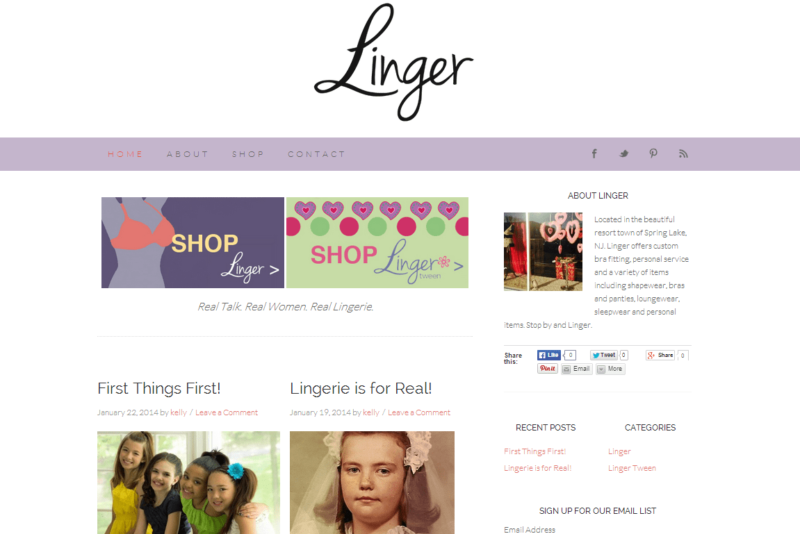 This website is for Linger, a lingerie boutique in Spring Lake, New Jersey. It’s mainly a blog for the owner, Kelly, to share fun things that are going on in the lingerie world and to promote her business. We did not include an online store as she was already setting one up using an alternate CMS before she contacted me. I really enjoyed talking to Kelly as we developed the site; she really seems to have fun with what she’s doing and I also really like her take on first bras for girls (she is big on creating an environment where moms can bring their daughters to shop without worrying about exposing them to all the unhealthy messages they might get shopping in a store like Victoria’s Secret). 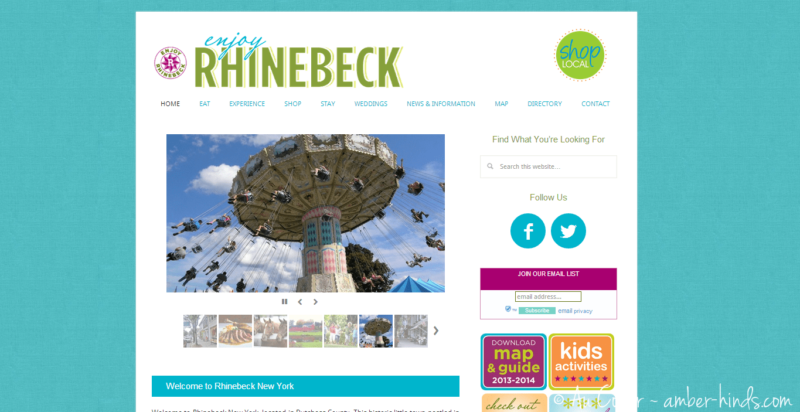 The second website that went live yesterday was a revamp for Enjoy Rhinebeck, a not-for-profit organization promoting local businesses in Rhinebeck, New York. This website was a HUGE project. I spent more than 40 hours on it, which is a lot for one of my websites. My friend Laura connected me with them; they already had a WordPress website but it was in need of a lot of help. Their previous theme was no longer supported by the maker and it was bogged down with a lot of out of date and unnecessary plugins. Everything was running old versions because whenever they tried to update WordPress or their theme or their plugins, the entire site would crash. Initially, I came in and just did a lot of clean up and updating to get them running where they needed to be. Then, I converted them over to the Genesis framework and a mobile responsive design, which turned out to be the biggest task of the whole project. The person who initially built the website had put all of the content into tables with widths built into the HTML rather than relying on a stylesheet to control layout — that meant I had to go through more than 100 pages and remove typically 3-4 tables from each one in order to make the website mobile responsive. A lot of people make the mistake of thinking that “posts” are only useful if you are writing a blog and that all other content should be contained in a “page.” This is what Enjoy Rhinebeck’s previous designer had done. Every single entry for their member businesses was set up as a page;then she had also set up separate pages for the business categories (restaurant, store, inn, etc.) and manually put links to each business’ profile on those pages. This set up meant that every time a business joined or left Enjoy Rhinebeck not only did a page have to be added/deleted for that business, but it also had to be manually added/removed from multiple category pages, the directory, and the map. That is a lot of work for a non-profit with little time and a limited budget. By converting their business profiles to posts instead of pages, all of their categories, etc. are now automated which will save them a ton of time and money in the future when they need to add or remove members. 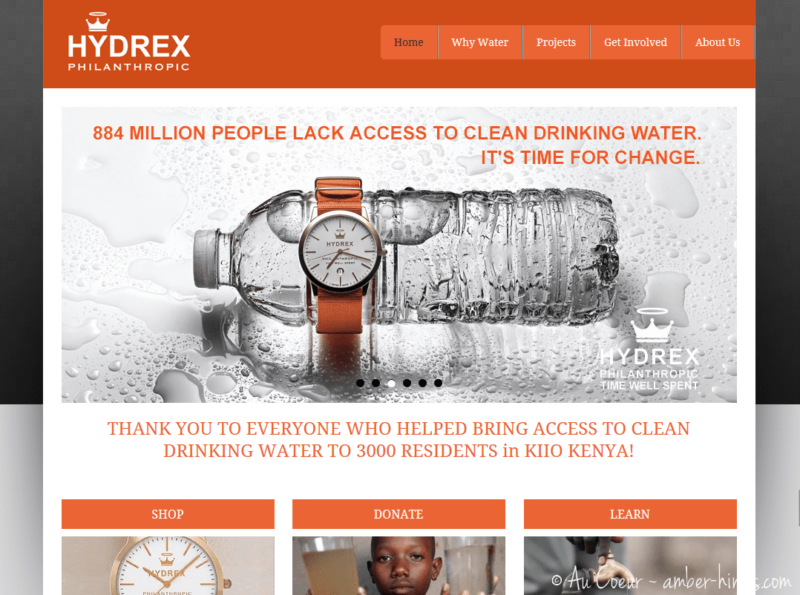 The final website I published yesterday was for Hydrex Philanthropic, a not-for-profit striving to end the world’s contaminated drinking water crisis. The website has a small shop in it where people can purchase watches and wristbands or make a donation to help fund Compassion International’s clean drinking water projects in Africa. Hydrex was started by Darcy Creech, owner of that awesome Nantucket hat shop tucked away on Federal Street (where we sometimes liked to sneak in nighttime play after pizza & pajamas at the library), after she visited a child she is sponsoring in Africa and saw the drinking water conditions first hand. Both of these were templates that I customized for her. The template sites are a nice option for people that don’t want to spend a lot of money and/or need a quick turn around. I can usually get these done in a day or two. 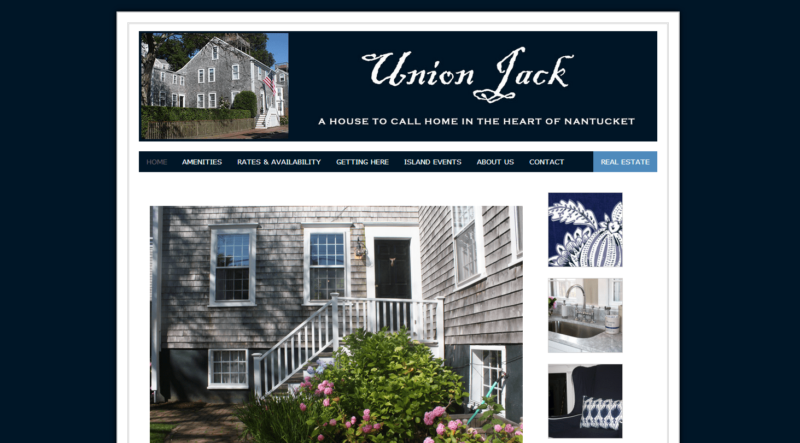 More custom websites I can usually do in a week; complicated situations like with Enjoy Rhinebeck will take me several weeks. Amber, Thank you so much for all your work on Enjoy Rhinebeck! The site looks great and we no longer have to worry about various pieces mal-functioning. Plus, with so many people using mobile devices, it’s nice to have a website that responds well and provides information clearly regardless of what type of computer a visitor is using. Thanks, Laura; I’m so glad you like it!